The Suzuki GSX-R is thirty years old this year. Unfortunately, the average age of the Suzuki GSX-R is no longer anywhere near that. Thanks to choke inducing insurance premiums, steadily creeping retail prices and bonkers licence requirements, new bikers have little to no chance of getting hold of a GSX-R until they have a good few years riding experience under their belts and piles of pocket money to burn. We all used to point and laugh at born again sports bikers. How dare they go off and have a life, only to come back with money to spend in the industry on new bikes and fancy kit! Put simply, those born again guys have helped prop the industry up during the recent economic assault course. They’ve also presented a fresh challenge for manufacturers. If your biggest spender is an ageing sports bike fan whether new to biking or not, they’ll only be able to pull off clips on and rear sets for so long before their back calls time or their wrists explode. What do they do then? Fifteen years ago they shuffled off in the direction of their nearest Harley dealer and kept their mouths shut, not so nowadays. The choice of bikes that aren’t classed as pure supersport machines is massive. Naked, super naked, sports tourer, adventure sports and so on and on. Trading in your sports bike is no longer a step down, more a side step. The dilemma that Suzuki faced is a fairly unique one in that their sports bike buyers are incredibly loyal. Sell someone a GSX-R600 in their late twenties and chances are he or she will still be a GSX-R customer twenty years later. And why not? 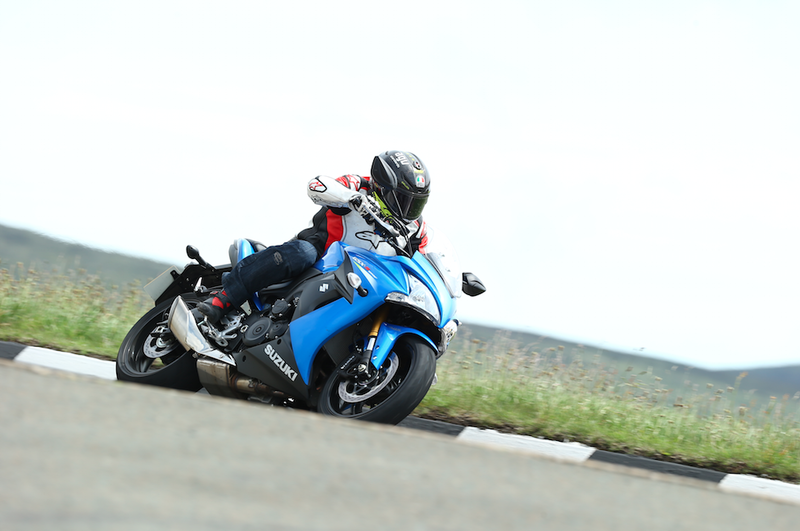 The GSX-R is and has always been, an absolute weapon. Sense catches up with everyone, mind. Suzuki has built this bike with the ageing GSX-R owner in mind and it’s called the GSX-S 1000F. The F stands for faired, as there is a naked version as well. But this is the one that we’ve just finished riding on the Isle of Man, so this is the one we’re going to focus our attention on. It’s an all-new machine. By that I mean the chassis is all new and specific to this bike. The brakes and swing arm have been lifted from the current GSX-R, if you’re going to borrow parts, why not borrow them from the lightest and most performance focused of your parts bins? Kayaba suspension front and rear is adjustable but very, very good in the standard settings that we rode on. This is suspension that is built and set up with sports riding in mind, firm and responsive without being jarring or uncomfortable, the front end in particular felt trustworthy within minutes. The naked version shares the same component parts, but a different amount of oil, giving this faired variant a more planted and better feeling front end. Especially when you couple that to the fairing, which brings the benefit of wind protection and down force. Twenty kilos at 200kmh, apparently. 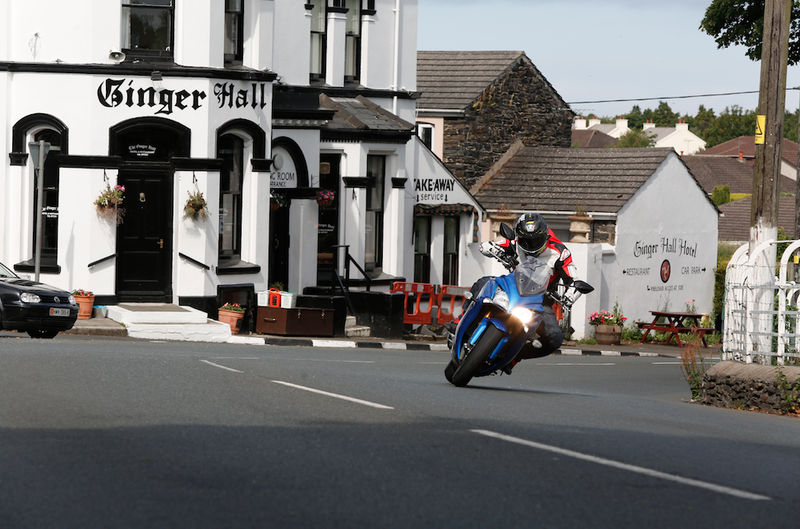 Our test rider and guide for the day on the TT course was Richard ‘Milky’ Quayle. A man who has done more laps of the course than anyone else I know. Milky commented on how much more stable the faired version felt at high speed, having ridden fast laps on both versions. He knows his stuff out there so I took his word for it. After a full and very fast day out on the TT roads, I asked him how fast he thought he could lap the course if it were closed and he were on it. Without a flinch he said the bike would do 115mph lap with nothing more than pump gas and a tweak on the shock. Obviously then he started verbally modifying the bike, adding speed here and there and nudged his way to a 120mph lap on a modded version, but a 115mph lap on the bike you can see in these pictures is praise enough, I thought. Slow speed drive was silky, that K5-K8 GSX-R 1000 motor has been retuned with new cams, lighter pistons and rings, new plugs and a new lining in the cylinders to reduce friction. With a respectable 145bhp at the brochure, I was looking forward to stretching the legs on the bike. More so when a loose lipped Japanese member of the project team let slip that the motor actually makes closer to 164bhp. Quite why Suzuki saw fit to play down the power this bike makes is beyond me. Maybe they didn’t want to scare off potential owners with big power claims, maybe the Japanese dude was making it up to get us excited. Until we get one on a dyno we trust, I’ll settle for saying this is a 150bhp bike until proven otherwise. The biggest feature I was looking forward to playing with was the three level traction control that was fitted to the bike. Level three provided the most control and was suited to the wet, two and one both offering support via sensors in the throttle, both wheels, the crank and the gear position. The system controls look clean on the left hand bar and were easy to navigate round using the clean dash layout. So, before we get to the riding, we should recap a little. This is a 214-kilo, 150bhp bike for GSX-R fans that can’t stomach aching wrists and bad backs after a day in the saddle. It has traction control, ABS, adjustable suspension and will cost less than ten grand. That doesn’t sound much like the Bandit/GSX-R parts bin lovechild I was expecting to ride. So, how did it ride? 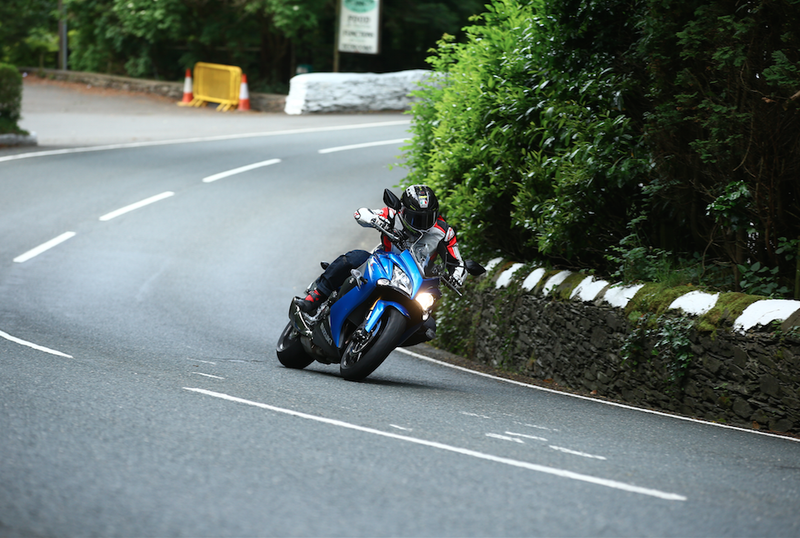 Each time we came to one, Milky went at it, straight to a speed that was on the prickly side of comfortable for me, especially in jacket and jeans (like I said, I wasn’t expecting the bike to be this sharp and packed the wrong kit). 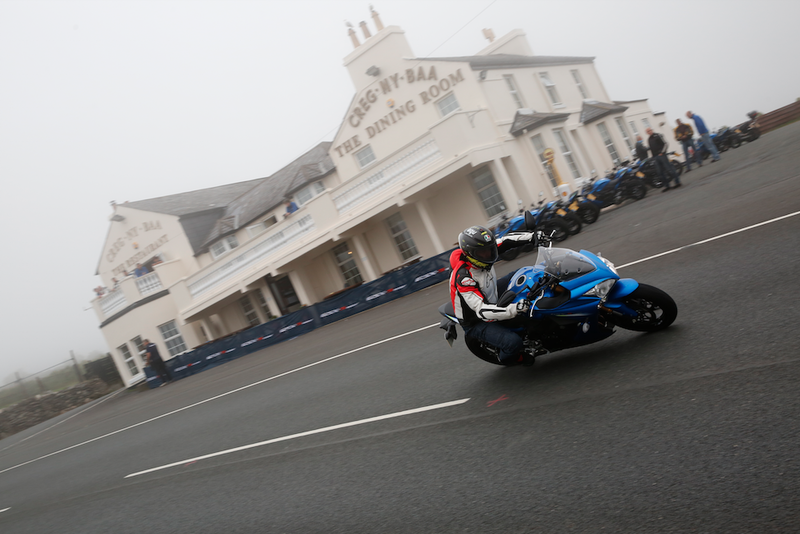 Throwing caution and gears to the wind, we got stuck in and whipped along at a fair old lick. Through the bump at Barregarow, I expected a kick in the balls and a bounce off the bump stops and got neither. Don’t get me wrong, we weren’t pinned in fifth, but we certainly weren’t pootling either. The suspension swallowed the lot while the wide bars made leverage through the left-hander easy. Scrubbing speed off came easy through the GSX-R spec brakes. I know GSX-R owners cite the standard brakes as the weak spot on the current model, I found plenty of lever feel and just the right amount of power each and every time I used them on the F, the ABS only cutting in a couple of times when I really tucked into the available stopping performance. At the first photo location, I told myself off for not wearing leathers, watching my mates bagging knee down shots on the first pass. This would be a good time to mention the oe Dunlop tyres. The Sportmax fitted come in a compound specific to this bike and were fantastic. This was a faster than average road launch and the tyres started to look like we’d been riding on track after a few blasts across the mountain. I had nothing but complete faith in the front and the rear. Eventually settling on level one on the traction control, I saw the light flash a few times in mode three and two, but didn’t get any of the clunking restraint that older systems used to display, it’s a system that the GSX-R owners would benefit from today. Speaking as a veteran of a GSX-R 1000 high side, I’m really pleased that Suzuki has taken their time and developed a system that works well rather than rushing something to market just to keep up with the neighbours. 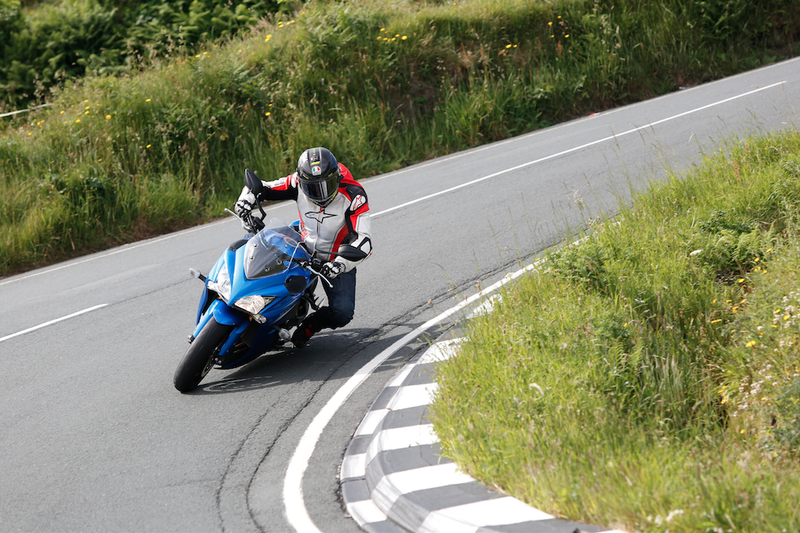 As well as this bike performed at the low speed round town stuff, it was on the mountain where it showed its GSX-R roots. Tearing through the gears along the mountain mile, it was in its element. Wind protection was good and the thing still felt super stable up over 125mph. Direction changes at high speed felt easy. Maybe part of that was because we were following Milky and he knows the way round, but he wasn’t riding my bike for me and I was more than happy to tuck in and go for it safe in the knowledge that the bike was more than up for it. Is this bike a Kawasaki Z1000SX rival? I’d say although it appears to be on paper, in reality this is a more dynamic bike to ride. Aside from the extra 17 kilos the Kawasaki carries, this bike feels sharper mid corner and more stable at high speed. 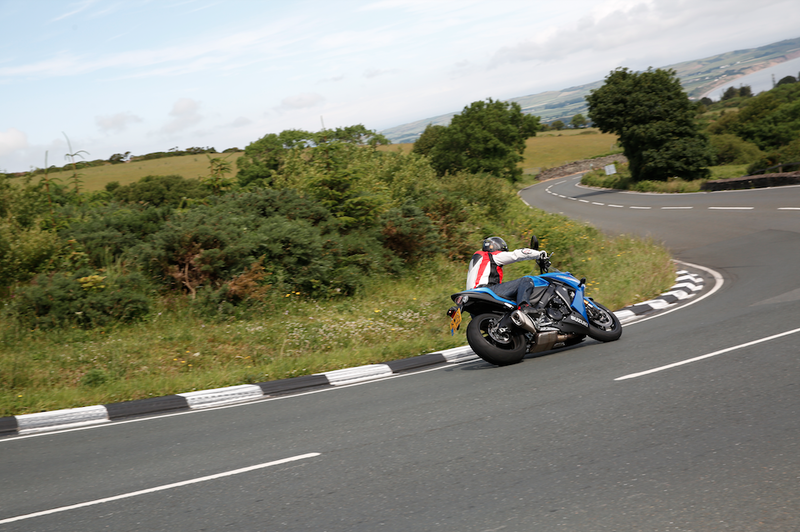 Both bikes have characterful and power packed motors, but the Suzuki is the more rounded bike when it comes to scratching and riding fast. What does this bike need to improve it? An exhaust and a set of fancy levers were the only things I could think of. It doesn’t need them as such, but what bike does? Like the rest of the project, Suzuki has listened to the feedback from current owners and there is a stack of factory accessories available. Does it really have any ‘GSX-R’ appeal? Yes, it definitely does. Saying it’s a GSX-R with wide bars and traction control doesn’t do the bike or the project justice, but if time were tight, that’s exactly what I’d say. Could I live with one? Without a doubt. It’d go well on track, handle day to day town riding with ease and would eat trips to the Ring for breakfast. Once I’d finished asking myself weird questions, I jumped back on, pointed the thing at Kate’s cottage and honked a half decent second gear wheelie (after turning the traction off). 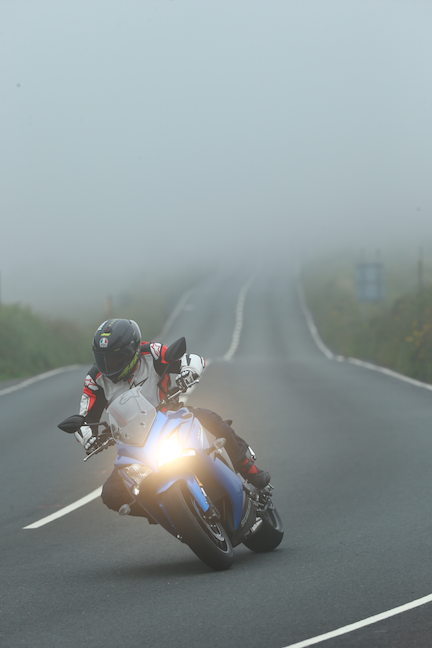 Rounded, more comfortable but still a willing hooligan, the GSX-S1000F is every inch a GSX-R. This bike is a credit to every single GSX-R owner out there. When I grow up and my back aches after a long day of riding, I’d be more than happy on one of these. Click this link to see the specs and find your nearest Suzuki dealer.